Set this up this evening, hoping to have our out of cage play tomorrow evening and see how it goes. They're always trying to climb on top of the cage, so I thought, hey maybe move some stuff around and make it safer for them up there. So giving this a try. They love to be places they aren't supposed to be... like the closet. Dot loves to run along the top of our hanging stuff! Lol, I know, they're like teenagers, give them an inch, they'll take a mile! I still just can't believe I slipped this one past Photobucket, shh. Last edited by Terry; 08/02/17 08:16 PM. So, last night I had Ollie and Skadoosh up there, Lulu wouldn't even come out. It was so funny, Ollie was the first out of the cage, so I put him up there, Skadoosh is at the door. She's looking up towards the top of cage, then at me, that back up again, and back to me It was like, "you know he's up there right? What are you going to do about it?" I then put her up there too, they both mostly explored the whole top of cage, I had to put them in the wheel, but they didn't stay in there long. They both, not at the same time, made their way over to the top shelf of my desk Like I said, give'em an inch, they'll take a mile. I'm not letting them have the top shelf too. So they will come back to you or at least allow to be herded back to the cage? Last edited by Ladymagyver; 08/04/17 06:12 AM. They are usually pretty good with that, though I don't test their limits, especially Ollie, He hasn't been with me as long, and was a few years older (4yrs) than the girls (about 1yr) when I got him, along with being in at least a few homes prior than with me, in his 4yrs of life . To stop them from going where I don't want them, I usually place my hand in front of them, then gently nudge them in a different direction, mostly towards me, somewhere it's okay, or their cage depending on where they are. For the most part that works. Sometimes I have to scoop them up, I do the two handed scoop, coming from both sides, this usually is less stressful for them, and they are normally pretty good at getting in my hands. Sometimes, they will scoot away, I figure if my approach is off, maybe because of the angle I have to get to them. When out of cage, I keep real close tabs on them, but still try to encourage exploration and activity where safe. One day we had to go to the basement due to tornado warning, this was maybe about two years ago. I grabbed the gliders from the cage in their sleeping pouch and stuffed them in their canvas carrier. To this day, I'm not sure what happened, but apparently in my hurry, Lulu didn't make it in the carrier. I'm guessing she was on me, perhaps between me and the carrier as I carried it down the first flight of steps. And I'm also guessing sometime at that point, while passing through the kitchen to head down the second flight of steps, she got off of me. I really do not know for sure, but she was in the kitchen when the warning passed and we all returned upstairs. I though all three were safely in their carrier, but as we got to the kitchen, my mom opened the door and in a startled voice, said there's an animal in our kitchen. I was thinking maybe a mouse, but didn't understand why my mom wouldn't say a mouse. I hurried into the kitchen and there was my Lulu, she ran, heading in an angled direction away from me towards the trashcan, maybe to hide behind it, but I came to her slowly and got down on the floor, calling her name, she did turn, and ran over to me when she saw me. She did let me scoop her up and hold her a bit, until I could get her inside the carrier with her mates. I'm not sure if this was a fluke, although it does really appear at times that she recognizes her name when I call her, she sometimes responds. I'm hoping tonight they all come out and have fun. Last edited by Terry; 08/04/17 08:53 PM. Out of cage play has been postponed to Saturday evening. The timing isn't working out where all of them are up and finished eating when I check in on them for play time . Why, oh why don't they cooperate???? Last edited by Terry; 08/04/17 11:23 PM. I'm not sure if this was a fluke, although it does really appear at times that she recognizes her name when I call her, she sometimes responds. Why, oh why don't they cooperate? It's part of their charms. Well all three were out tonight and partying on their rooftop playground. I added their tree house and one of their cabanas also, so moved the wheel a little more to the right. The cabana is sitting on top of the stacked boxes and the tree house is on top of the travel carrier cage. I also put a few pellets in the blue cup. They use the travel carrier cage as monkey bars, lol, climbing all around it. Ollie and Skadoosh both enjoyed the tree house for a bit. No one ran in the wheel yet, but I think they will eventually, they like that wheel when it's in their cage. I may switch out the floor stand for a lower one, see if it makes a difference. I like to use the tall one when wheels in the cage and the shorter one for travel cage (Glide-arium). They seemed to have a blast, but all went into their cage on their own after a while. Oh, and skadoosh jumped from the top to my arm while I was standing on the ladder. She ran up to my shoulder and jumped onto the fleece covered door (I drape a fleece throw over the door for out of cage play time). She did climb the little bit left to the top and looked at me, so I climbed down the ladder and she jumped to me. Skadoosh hasn't done that for a while. This is what I've come up with so far for the cage top playground. I'm ordering a Custom Cage Liner from Jana to use for it, but so far I'm testing this configuration. Looks like a lot of fun to me! I never thought of a cage liner for the top. Great idea! Thanks. Jana's awesome to work with and her products are amazing! I just let them up there for a bit this evening, they were still a little groggy from their days' sleep, lol. But they still went exploring. Seemed to like it, until one tries to climb down the cage to the floor I'm like, oh no you don't, I'm not making a floor level playground! I don't have anyway to prevent them from getting where I can't get them down there. Well last night was a blast with Skadoosh and Ollie! Skadoosh went up top first and was checking out everything everywhere, she even climbed the play gym I set up! Ollie soon came out and joined in the fun, he climbed the play gym also and jumped on to the cabbana, before exploring the view from the top. Neither would jump or glide to from up there, not yet anyway. Lulu didn't join in this venture, nope, instead after a little grooming on me, she jumped to the cage and headed to the floor (WHAT!) I can't believe this! I told her "no girl, playground is up top, you can't go down.". I used my hand to gently direct her up, but she went into the cage instead and copped a tude . PS. I'm working on idea for top of the stacked boxes. Last edited by Terry; 08/10/17 02:23 PM. I wish pool noodles would work for under my bed, but I got other furniture crammed in my tiny room, lol, I'd be tripping over them constantly, and then there's my closet. My closet is also small, and I use curtains, but it would be a bear trying to get them out from there. I'm hoping they'll get used to going up and that I can keep it somewhat interesting rotating things around that they won't get bored. It's not like they have hours up there, just about 3X/week, and the weeknights are fairly short sessions, because I can't stay up as late. I got a couple of pics of Ollie and Skadoosh this evening, going to try getting them up on here, maybe file manager. I went to my storage unit today to get a few things to use up top to make it more fun, and also because the CCL from Jana came yesterday. I hand washed & lined dried it, it's so, so nice! I am using File Manage again this time. Last edited by Terry; 08/13/17 07:20 PM. Well this is beyond he experimental now, lol. 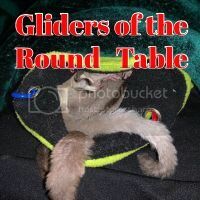 All the gliders have had a chance to explore. Skadoosh was back to her old, exploritorian self, Ollie was very interested as well. Lulu, well she sort of checked it out later all by herself, but she hasn't realized the extent of it as of yet. Hoping tomorrow night is a good one for all three. They were out a bit Fri, Sat, and even some Sunday evenings, so I skipped Monday and will resume the normal schedule on Wednesday evening.